Early history of the Kolar Gold Fields was compiled by Suryavardhana , Superintendent of the Wesleyan Tamil Mission, Bangalore and Kolar Gold Fields. His studies and observations have been published in the quarterly journals of the Mythic Society and other academic journals. In about the second century the Gangas founded Kolar and as long as they were in power, for nearly a thousand years, they took the title 'Kuvalala-Puravareshwara' (the Lord of Kolar) even after they had shifted their capital to Talakadu. From Kolar, and later from Talakadu, the Gangas ruled over Gangavadi comprising the southern districts of the Kannada people. The records are clear that Kolar came under Chola rule in 1004 for the first time.In accordance with their usual system, the Cholas gave the name Nikarilichola-mandala to the District. In around 1117 AD the Hoysalas under Vishnuvardhana captured Talakad and among his conquests he captured Kolar and drove the Cholas from Mysore state. On the death of Somesvara, in 1254, a partition of Hoysala dominions took place between his two sons, and the Kolar district was included with the provinces to the share of Ramanatha. The next king, Ballala III however reunited the Hoysala dominions. Kolar is much older than Bangalore, its origin going back to the 2nd century AD. Gangas made Kolar their capital and ruled over Mysore, Coimbatore, Salem and Trave. In the 13th Century AD, Sage Bhavanandi composed his treatise on Tamil grammar Nannool at the Ulagamadhi cave at KGF, under the patronage of Seeya Gangan one of the Ganga rulers who was born in Kolar and was a patron of arts and literature. Further Seeya Gangan's inscriptions indicate that Kolar regained control of Kolar for the second time from Chola hands. During the reign of the Cholas, King Uththama Chola (970 AD) is said to have built the temple for Goddess Renuka,. The Chola rulers Veera Chola, Vikrama Chola and Raja Nagendra Chola erected stone structures with inscriptions ar Avani, Mulbagal, Sitti Bettta and other places. Chola inscriptions also indicate the rule of Adithya Chola I (871-907 AD), Raja Raja Chola I and Rajendra Chola I over Kolar. These inscriptions refer to Kolar as 'Nikarili Cholamandalam' and also as 'Jayam Konda Chola Manadalam'. Inscriptions of Rajendra Chola I also appear on the Kolaramma Temple. Many Siva temples were built in Kolar during the reign of the Cholas, such as the Someshwarar Temple at Maarikuppam Village, Sri Uddhandeshwari Temple at Maarikuppam Village, the Eswaran Temple at Oorugaumpet, the Sivan Temple at Madivala Village. The reign of the Cholas over Kolar lasted till 1116 AD. Sadly the Chola inscriptions scattered all over Kolar lie neglected, and some subject to wilful cultural vandalism. According to B. Lewis Rice, this story is evidently based on some confused reminiscence of certain names and historical events. From the records of the period we know that the Cholas subverted the power of the Gangas by the capture of Talakad in about 1004, and speedily possessed themselves of all the south and east of Mysore. The important city of Kolahala, or Kolar, thus became subject to them, together with the whole of the present Kolar District. In 1117 AD, Kolar came under the reign of the Hoysalas, and in 1254 AD the dominions were portioned among the two sons of King Someshwara, with Kolar included in the provinces that went to Ramanatha. The next king, Ballala III, however reunited the Hoysala dominions. The Hoysala were defeated by the Vijaynagar Kingdom, and their rule over Kolar lasted from 1336-1664. During their reign the Sri Someshwara Temple at Kolar was built. During this time, in 1418 Thimme Gowda of the Morasu Vokkalu clan struck a treaty with the Vijayanagar Kings and ruled the Kolar District. His successors ruled for over four generations. In the 17th Century, Kolar came under Maratha rule as part of the Jahagir of Shahaji for fifty years. Then under Muslim rule for seventy years. In 1720 AD, Kolar came under the Suba of Sira, with Fateh Mohammed, the father of Hyder Ali becoming the Faujdar of the province. After this Kolar passed through different reigns such as Marathas, the Nawab of Cuddapah, Nizam of Hyderabad and finally Hyder Ali. In 1768, Kolar came under British rule briefly till 1770, then passed briefly again to Maratha rule and again Hyder Ali. In 1791 Lord Cornwallis conquered Kolar, before passing it back to Mysore under the peace treaty of 1792. Kolar has been part of the Mysore State since that time. With the growth of the Gold Mines and the resulting demand for labour, people from Dharmapuri, Krishnagiri, Salem, the North and South Arcot districts of Tamil Nadu and Chittoor, Madanapalli and Ananthapur districts of Andhra Pradesh, were settled around the various shafts. In course of time these habitations expanded to merge into each other to form the outer reaches of the town of KGF. In the core of the town were the families of British and Indian engineers, geologists and mine supervisors who lived a grand colonial lifestyle complete with golf course, tennis court, club with dance halls and bars, cottages and Bungalows with gardens and quarters for the employees and churches and chapels. The ruins of these structures and some memorabilia continue to exist even today. Many places in the area have names reminiscent of the raj. The two main townships which came up subsequently in KGF were Robertsonpet and Andersonpet, named after two British officers in the mines. In June 1902, electricity was supplied for the mining operations at KGF, from India's first and oldest power generation plant which was called the 'Kaveri Electric Power Plant' from Shivanasamudra. Subsequent establishment of the BEML public sector enterprise brought further expansion to the city providing employment to existing populations while also bringing in new populations that added to the cosmopolitan nature of KGF. Pyroclastics & Pillow lavas of Kolar Gold fields at Kolar Gold fields(kgf) has been declared the National Geological Monuments of India by the Geological Survey of India (GSI), for their protection, maintenance, promotion and enhancement of geotourism. In 1901, an English Medium Primary School was established by the John Taylor and Sons Company, at the Nandydoorg Mine, for providing education to the children of British and European workers of the company. It came to known as the Kolar Gold Fields Boys School Oorigaum, and was later upgraded to Middle School and then to High School, with the students appearing to Lower Cambridge and Senior Cambridge Level Exams. However this school was co-educational only up to Primary School, with girls being excluded after that. To meet the educational requirements of girls in KGF, on 15 January 1904, the Sisters of St. Joseph of Tarbes established two schools in KGF - An English School for Europeans and Anglo Indians with 22 children, and a Tamil School with 7 children. The school operated in the compound of St. Mary's Church, Champion Reefs, with Sis. Teresa of Jesus serving as Head Mistress for both schools. Further, St. Mary's Boys School, a Boys Tamil school was also established in the same St. Mary's Church compound. Funding was made available from the Mysore Government since 1927, with Rs.98 grant towards the English school and Rs.82 grant towards the Tamil school. The English Convent subsequently developed into High School with Senior Cambridge Level and the Tamil Indian School with Junior Cambridge Level. The St. Mary's Boys School was moved to Andersonpet after an airblast incident. In 1933, the Order of the St. Joseph of Tarbes started the St. Theresa's School in Robertsonpet and then in 1943, the St. Sebastian's School at Coromandel. With both schools offering English and Tamil Medium of instruction. To cater to the educational needs to the growing Marwai population at KGF, the Sumathi Jain High School an Hindi Medium School was established in Robertsonpet. KGF has a Dental College which is KGF College of Dental Science & Hospital ,an Engineering College which is Dr. T. Thimmaiah Institute of Technology (Formerly known as Golden Valley Institute of Technology - GVIT), a law college- Sri Kengal Hanumanthaiya Law College, a PU college-KGF PU College ,a degree college -KGF first Grade College, Sri Bhagawan Mahaveer Jain College Kgf. KGF also has the National Institute of Rock Mechanics (NIRM) which is run by the Ministry of Mines with the help of GSI and IBM, and Vijaylakshmi college. The official language is Kannada. 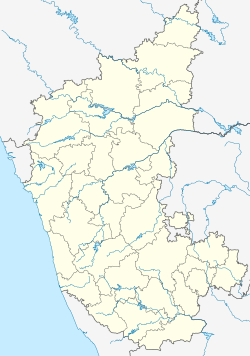 Even though the Kolar district itself has a majority Kannada speaking population tamil is also spoken by many. Most of the Tamil population trace their ancestry to the labourers brought in by the British from the North Arcot, Chittoor, Salem and Dharmapuri districts of the Madras Presidency, during the late 19th century. The migration was necessary, as the local villagers refused to work for the British (p. 336). There is also a substantial Anglo-Indian population at KGF, descendants of the English mine supervisors. 1 2 Goodwill, Fred (1918). "Nandidroog". The Quarterly Journal of the Mythic Society. 9–10: 300. Retrieved 27 August 2014. 1 2 Goodwill, Fred (1921). "The Religious and Military Story of Nudydurga". KGF Mining and Metallurgical Society (5). 1 2 Srikumar, S (12 March 2014). Kolar Gold Field: (Unfolding the Untold) (International ed.). Partridge Publishing. pp. 40–46. ISBN 1482815079. Retrieved 27 August 2014. ↑ Chandrashekar, Gayatri (2015). Grit and Gold. Partridge Publishing. ISBN 9781482855845. Retrieved 11 July 2016. ↑ Rice, Benjamin Lewis (1994). Epigraphia Carnatica: Volume X: Inscriptions in the Kolar District. Mangalore, British India: Department of Archaeology, Mysore State. p. i. Retrieved 4 August 2015. ↑ Iyer, Meera (21 June 2015). "Miscellany - A time capsule" (Bangalore). Deccan Herald. Retrieved 7 August 2015. ↑ "Geo-Heritage Sites". pib.nic.in. Press Information Bureau. 2016-03-09. Retrieved 2018-09-15. 1 2 White, Bridget (2010). Kolar Gold Fields - Down Memory Lane: Paeans to Lost Glory!. Central Milton Keynes: Author House. ISBN 1452051038. Retrieved 6 January 2015. ↑ White, Bridget (15 November 2010). "Tale of two thriving townships" (Bangalore). Deccan Herald. Retrieved 13 January 2015. ↑ "Data on Language and Mother Tongue". Censusindia.gov.in. Retrieved 25 August 2018. ↑ "Kolar Gold Fields: Land with Golden People". Blogspot. Retrieved 6 January 2015. ↑ Steve, Arul (April 2013). "Specialization On Social And Cultural Indifference Among KGF Tamil Migrants". ArulSteve736. Word Press. Retrieved 6 January 2015. 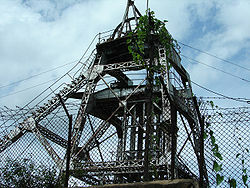 Wikimedia Commons has media related to Kolar Gold Fields.